unique qualities of flowing transparent pure watercolor to create mysterious rhythmic works, while in other pieces she incorporates a variety of other watermedia. In addition to painting, she has expressed her vision in: forged metal and wood sculpture as well as leaded glass design and residential architecture. The continuing source of inspiration for Laird’s work is a lifetime interest in cycles and natural transitions and connections. Her paintings have received numerous awards in National and International exhibitions. 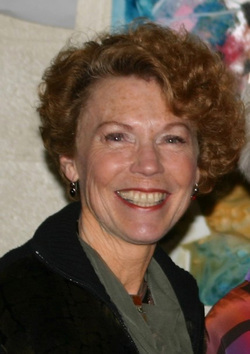 Laird is a signature member of National Watercolor Society, where in 2008 her painting was selected for the Loa Sprung Award (top award for Non Objective Painting). She is a signature member of Watercolor West, National Association of Painters of Acrylic, San Diego Watercolor Society, and is a full-juried member of the Society of Layerists in Multi-Media. She is affiliated with other art associations nationwide. She is a highly sought after instructor and was named one of 20 Great Teachers of the last twenty years, by American Artists’ Magazine. Her paintings and articles have been in many publications, including Watercolor Magazine, American Artist, and International Artist Magazine. Her work is included in Splash IV, North Light Books, and Artistic Touch 3. Creative Catalyst Productions produced her video, “The Informed Intuitive Approach”.